We are a professional house extension building contractor serving Harrogate and the surrounding area, so if you are looking for a conservatory extension, rear extension or side return extension, I & C Watts is the company to call. House extensions are one of the best ways to maximise on your space and increase the value of your Harrogate property should you decide to sell in the future. I & C Watts have many years of experience in building home extensions as well as liaising with architects and structural engineers to keep designs on track as well as making any on-going alterations you may consider along the way. Building regulations and planning permissions most often impede on grand designs, however we have vast experience in this area and can provide insight into what might or might not be possible, along with alternative ideas and solutions. We offer a full design and planning service and work with a wide range of recommended Harrogate based architects taking your plans from paper to completion. This includes everything from start to finish including roofing, plumbing, electrical, plastering and decorating work. A conservatory extension can be a great way to add extra leisure space to your house with an area that brims in natural light and greatly increases the pleasures of living in your home year-round. However, many people build conservatories and then find that they don't use them as much as they thought they would. This can be down to any number of factors but is mostly due to faults in the design and planning process. We can help you decide whether a conservatory extension is truly the best option for your needs. 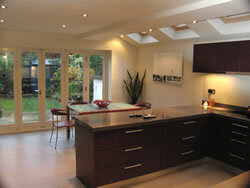 If you have sufficient space, a rear extension has enormous potential to change the very nature of your house. This type of home extension can be combined with internal alterations to open your kitchen up to your back garden and create a light, airy, open-plan area that can be used as a combined kitchen, dining, living and entertaining area. Turning your kitchen and back area into more of a focal point can have immense advantages but costs can escalate quickly so it's necessary to have a thorough, well-costed plan in place. A side return extension is usually used to create extra space in existing rooms or to re-arrange your house to create extra bedrooms, bathrooms or living areas. Side return extensions can also be combined with rear extensions to form a wrap-around extension. Although wrap-around extensions are often quite time-consuming and cause a significant amount of disturbance, they offer you the maximum amount of flexibility to re-order the layout of your house to exactly suit your needs. What House Extension is right for me? If you want to know what types of extensions are available for your home along with an idea of cost for building a house extension in Harrogate or the surrounding area, please call us or use our call back conact form so we can get in touch straight away.